A Family Nature Club favorite – kids can make a fossil collection from the park’s fossil collecting piles behind the Interpretive Center. Meet at the collecting piles in the back of the parking lot. 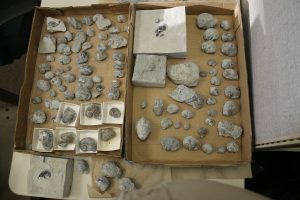 Learn about fossils and how to recognize them. Participants will label and attach their finds to a “collection card.” Removing fossils from anywhere else in the park is against the law. Program led by Naturalist at Heart volunteers Dan Gray and Neal Coleman.